A favorite in any Indian kitchen, a Haman-Dasta is generally known as mortar-pestle, is perfect for pulverizing and grinding herbs and spices into seasoning pastes and spice mixtures. Traditional hamam-dasta's made of wood and granite has now given way to steel or ceramic ones. A hamam-dasta unlike a food processor which only shreds and tears ingredients, allows fragrances and flavours to be beautifully blended. The Brass & Stainless steel Khalbatta is made with high quality Brass & Stainless which ensures durability. The Khalbatta is designed to blend along with other kitchen accessories. It is attractive, easy to use, hard and heavy and has a solid handle for easy grinding. Bring home this khalbatta, ideal for grinding herbs and spices but also can be used for tea and medicine purposes. Hygienic and easy to maintain it would be a handy accessory to have in your kitchen. 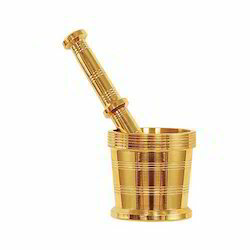 Brass Pestel & Mortar is an traditional tool still used today in the kitchen to crush items into a paste or powder. Can be used to crush herbs into a fine paste and hard seeds and spices into powders. Polished mirror brass finish in a rustic authentic style. Manufactured using High Quality Brass, Brass Khalbatta is known for its Optimum Performance and Corrosion Resistance. The production of this product involves using Quality Materials and Advanced Technology under Expert Supervision & Experienced Staff. We believe in providing Quality Products to our clients and thus we process all our products through a number of Quality checks. This product is widely used in most Indian kitchen for the purpose of Grinding & Crushing Various Spices, Ginger, Garlic, Various Herbs & Shrubs for Medicine Purpose & even Onion. We offer this Quality Product in various sizes depending on the needs of the client which varies in dimensions & weights.